Apple had the consumer in mind when it added a multi-carrier SIM card to its new iPads, said Apple vice president of iPhone, iPod and iOS product marketing Greg Joswiak in a recent Re/code interview (via Fierce Wireless). But that motivation does not mean the Apple SIM will be making its way to the iPhone any time soon, as Joswiak noted most consumers go directly to their carriers to buy iPhones, while the iPad more often is sold through Apple's retail channels. "It's about the customer experience," he said during an appearance here at Re/code's Code/Mobile conference. "We ultimately don't know who you are going to use as the carrier, [and] we want to make it as easy as possible." Joswiak said Apple has not discussed putting the Apple SIM into iPhones, but said that because of the way most customers buy an iPhone--through a carrier directly--the Apple SIM is not as well suited. "I don't think you're going to go to the Verizon store and say, 'Can you hook me up with AT&T?,'" he said. With most iPhone customers committed to their carriers for a significant period of time, either through contracts subsidizing the phone cost or through payment plans, multi-carrier SIM cards make less sense for iPhones. Apple's new universal SIM in theory allows customers to activate with one carrier and then switch to another carrier as needed, but there are some limitations. The Apple SIM is currently only compatible with AT&T, T-Mobile, Sprint and UK carrier EE. Verizon confirmed that is not adopting Apple's new SIM, instead requiring customers to activate with a Verizon-specific SIM. In addition, while AT&T is listed as a compatible carrier, the provider is not fully supporting all the features of the SIM. 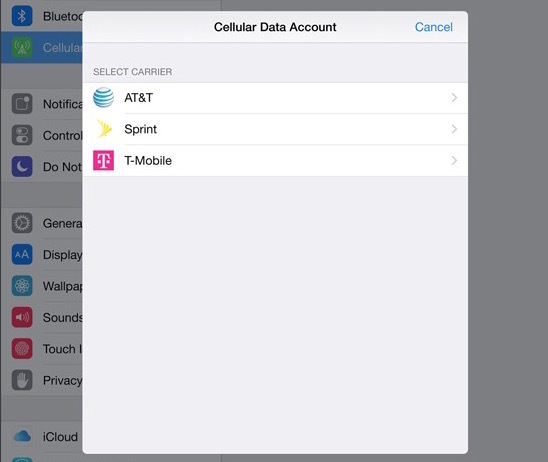 Apple and AT&T have confirmed the carrier is not allowing its customers to switch once the Apple SIM has been activated on AT&T's network, instead opting to lock the SIM to its network following activation. Customers who activate service on AT&T will thus have to purchase a new SIM if they want to use their tablet with another carrier. Apple introduced the new iPad Air 2 and Retina iPad mini 3 earlier this month with sales beginning last week. Both tablets feature a universal SIM, Touch ID, and storage options of 16, 64 and 128GB. The iPad Air 2 also includes a new A8X processor, antireflective display and 2GB of RAM. The iPad Air 2 retails at a starting price of $499, while the iPad mini 3 costs $399 for the base model. Rather off topic but, doesn't the name "Joswiak" sound like a combination of "Jobs" and "Wozniak"? Verizon said outright that they do not want to play. AT&T says they will play, but then locks the SIM card. Which is the worse response? I don't see why not? It's a programmable SIM card. They could stock a single iPhone model, not worry about what SIM was packaged in it, carry it to the sales floor, and go... who cares if programming the SIM to carriers locks that SIM to that carrier? It doesn't lock the device there, just the SIM. Get a new SIM if you want to switch, it isn't that difficult. They often give you the thing for free, or for a penny, when signing up. Not a big deal for me, traveling abroad and swapping SIM cards is still much easier. It is still an actual SIM card... it's just programmable. You could still swap at will. I really hope someone sues AT&T over this universal sim sim locking. They are permanently damagaing hardware that is mine by locking it to their network. To bad Apples isn't making the SIM in a way that it cannot be locked. (I'm not saying that ATT's decision to lock the SIM is Apple's fault just that it might be nice to have roadblocked that possibility from the beginning) Has ATT said "Why" they are even locking the SIM? it just doesn't make sense because the device isn't locked and it's easy enough to go get a new SIM. If ATT wants to have a locked SIM they should just put one of their own SIM cards in the device at activation and hand the Apple SIM to the customer to do with as they see fit. Verizon confirmed that is not adopting Apple's new SIM, instead requiring customers to activate with a Verizon-specific SIM. By eliminating choice, you've made the choice easy. Definitely going to try out T-Mobile next time around. It would be nice if apple would sell the apple sim in it's stores and on it's web site for those who have been locked by AT&T. It's not available on the web, but you can buy it in Apple stores for $4.99 (the model number is MJVV2LL/A). "Apple has not discussed putting the Apple SIM into iPhones"
Because CDMA didn't take off outside the US. SIMs are wonderful for consumers as they let you switch carriers easily. If they weren't there then likely it would be like it is with CDMA carriers where they don't allow phones that were originally for other carriers onto their network. At best you'd have two or 3 carriers available for any particular model, and you couldn't switch to an unsupported carrier like you can with a sim card. Or maybe it's 2014 and someone could make a phone that could switch carriers on the fly? People get locked in on old thinking when it comes to this stuff.